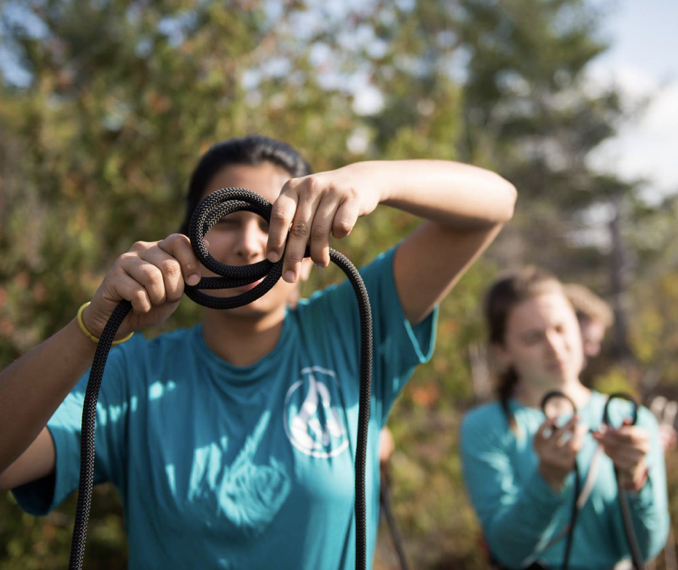 How to Run an Outdoors Club is the ultimate guide for student leaders. Check out the full series here. A team of well-trained leaders is instrumental for safe, smooth-running club trips. Most student-run clubs, though, neglect to comprehensively train new leaders, instead relying on prior outdoor experience and learn-as-you-go methods. Relying on incoming leaders to be already knowledgeable in technical outdoors skills and group facilitation raises a handful of issues. First of all, non-standard leadership methods put a great deal of stock in an individual leader’s problem solving skills, and do not ensure that leaders are familiar with club protocols. Further, doing so also limits who can lead for a club to those who have had the privilege of being exposed to outdoor recreation prior to college–often, a homogenous group. A comprehensive leader training program, on the other hand, ensures that all leaders are on the same page, and allows a club to grow and diversify by providing opportunities for leaders to develop new skills regardless of prior experience. The additional benefits of leader training are endless–it demonstrates legitimacy of a club to university administration, mitigates the risk of liability issues arising, and much more (see How to Run an Outdoors Club: Liability). But developing a curriculum from scratch is a massive undertaking. The following guide will concisely outline a number of topics that should be included in every leader training, discuss how to get a new program off the ground, and list some of our favorite leader training activities. See below for useful resources gathered from outdoors clubs with successful leader training programs. To lead a successful trip, one must be competent with the technical skills that an activity entails. Trainings will vary depending on what activities your club facilitates and the structure of your club. Should all of your leaders be competent in a range of activities, or do you prefer to have specialized leaders who are experts in one given field? The following skills are useful for leaders of any outdoor activity. This list is not comprehensive of all skills a competent leader should master–the types of trips run by your club will dictate training. Any club trip should have be led by a person certified in wilderness medicine. Wilderness First Aid and Wilderness First Responder certifications are standards of the outdoor industry. Check out SOLO and NOLS to find courses near you, or hire an instructor to teach a course on campus. Safely cooking over a stove or fire, stove maintenance, and backcountry meal prep are mandatory skills for anyone leading a group on a multi-day adventure. Day hikers, backpackers, and paddlers alike should feel comfortable using a map and compass to orient in the backcountry. Competent leaders should be skilled not only at bagging peaks and scouting rapids, but also putting in the work to get a trip off the ground in the first place. Make sure new leaders are trained in the particular processes your club implements to get participants outside. If you think back on a role model or person in your life who demonstrated exceptional leadership, it likely wasn’t only their competence in hard skills that makes them stand out. Excellent leaders communicate well with others, are good listeners, and effortlessly maintain high group morale. Soft skills are easy to overlook while developing a leader training curriculum–don’t. Soft skills such as group facilitation, conflict resolution, and communication can be taught just like orienteering or knot tying. Just a few important soft skills are exemplified here. See the resources at the bottom of the page to learn more about training soft skills. Teamwork is imperative to navigating a raft downstream or pulling together a backcountry feast. Good leaders know how to mobilize a group to accomplish tasks and ensure that all group member interactions are positive. A successful trip is characterized by participants who get along well. After a cold day of hiking and when hanger sets in, tensions can run high. A good leader knows how to diffuse any conflicts through conversation. The best leaders always open a clear line of communication with their co-leaders and group members. Whether it’s choosing which line to run, what trail to follow, or next steps in the face of an emergency, a good leader can remain calm and steer the group in the right direction. A comprehensive leader training program allows you to welcome leaders who have little to no outdoor experience prior to joining your organization. 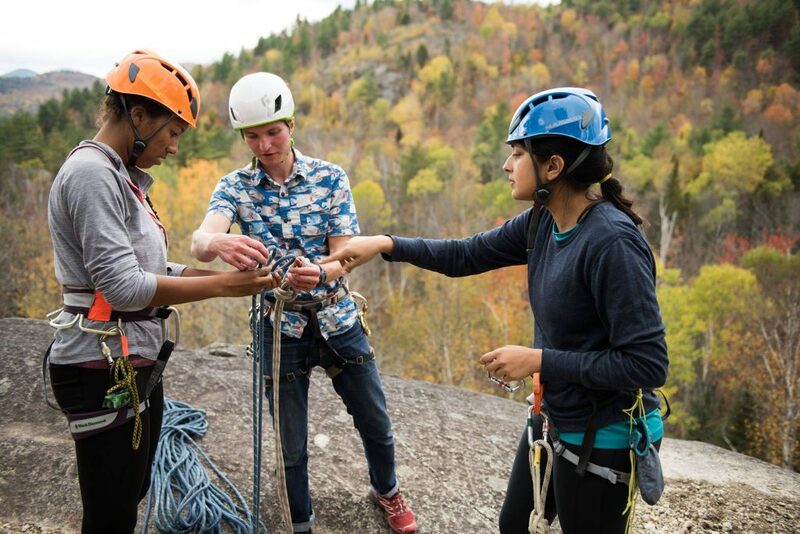 In this way, leader training can play a huge role in diversifying the outdoor community, and your club can be a welcoming space for every student. Your club’s leadership team should resemble the diversity breakdown you hope to see on every trip, and training is a great place to start. Undoubtedly, the hardest part of leader training is launching a new program. 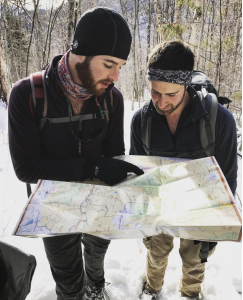 If your program has only allowed experienced outdoors-people to lead trips in the past, it can be difficult to make the transition to accepting new leaders with little to no experience. The following tips will help you get a new leader training program off the ground, or evolve an existing once. Don’t expect to launch an elaborate, multi-week training program all at once. Determine what information and skills are most important for your leaders to possess, and choose a weekend to hold a retreat or training trip to convey those points. You can use this weekend training as a launching point for more comprehensive training in the future. Take advantage of veteran leaders who know the logistical ins and outs of your club, and who have demonstrated reliable leadership. Pair new leaders up with a returning “buddy,” who can show them the ropes on a personal basis. This alleviates some of the difficulty of training a large group of leaders all at once. Only so much can be learned in the classroom. The best way to practice leadership skills is to get outside and lead. Divide new leaders into groups led by veteran leaders for a weekend trip. New leaders can practice the skills they’ve learned in training, and take turns acting as leaders for the group. If your resources are limited, take advantage of training opportunities from other programs within or beyond your university. Ask to join or shadow training from other organizations, while you develop a program for your club. Reach out to professional guides and educators in your region who have experience in outdoor leader training. Many professionals across the outdoor industry are willing to share their expertise with blossoming leaders. Developing a training manual ensures that your leader training program can evolve over time. A manual will also be an invaluable resource for new leaders joining the club. Update the training document as you work out the kinks of your club’s personalized training program over the years. See below for example training documents. Planning your first leader training session or retreat and don’t know where to begin? These tried and true activities will engage your leaders in training and sow the seeds for valuable development. Acting out situations that may occur on trips is a simple, yet highly effective way to train for the vast array of problems than can arise on the trail. Assign a returning leader or trainer to be the facilitator who presents a scenario to a leader or group of leaders. The facilitator sends a leader away from the group momentarily, then tells a group of volunteers a scene to act out. The leader then returns to the group and must improvise to resolve the situation. Once the scenario has been played out, the group should analyze how the leader handled the situation. Scenarios can cover all sorts of topics, from emergency medical situations, instances of disruptive or disobedient participants, weather emergencies, etc. Scenarios are especially useful for practice handling difficult interpersonal interactions between co-leaders or leaders and participants. Debrief questions: What did you notice about the leader’s or the participant’s behavior that exacerbated or diffused the situation? What did the leader do well in this scenario? What could the leader have done differently to better handle the situation? The most effective leaders understand and support the mission of your organization. At the beginning of the school year or semester, read your organization’s mission aloud to leaders, and pose the question, “what will you do as a leader to uphold the mission of our organization?” Allow leaders time to consider the question, and have everyone write down their response or pledge, on a slip of paper. Then, have everyone share their pledge with the group. Pledges can be displayed in your club’s office or meeting space to reference throughout the year. This activity works especially well to initiate conversations on difficult topics such as diversity and inclusion in the outdoors. Pose a question to the group that will initiate meaningful conversation (see examples below). Allow leaders time to consider and write their responses on slips over paper. Have each leader crumple their response into a ball and place it in the middle of the circle. Then, go around the circle and have each leader pick a piece of paper from the center and read it aloud to the group. Everyone’s thoughts will be shared anonymously in this fashion. Debrief the reading with a group discussion. Example questions: What aspects of your identity have facilitated or hindered your access to the outdoors? What does our organization do well to provide access to outdoor recreation? What aspects of our organization might hinder access to the outdoors to certain individuals? What does our club need to improve? This multi-phase activity will help your leaders determine and understand the values that are central to your organization. This can be useful when drafting a mission statement, or simply when introducing new leaders to the club. Hang large sheets of paper around the room, each with a general question intended to get leaders thinking about club values. Example questions: What does the outdoors mean to you? 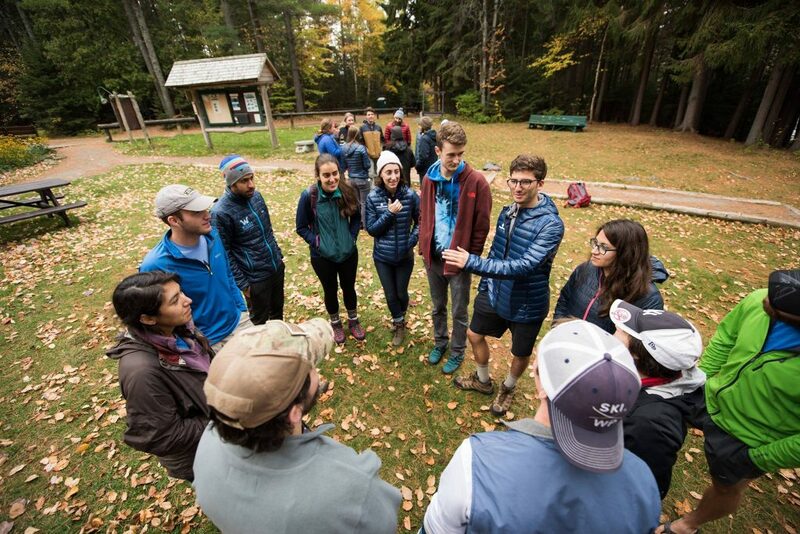 What is the role of an outdoors club at a university? What makes our organization special? What is your favorite memory from your time in the club? Allow 10-15 minutes for leaders to walk around and write responses on each sheet of paper. Then, allow another 10 minutes for leaders to walk around again reading their peers’ responses. Gather the group to discuss phase one. Ask what people noticed about the responses. What are some common words or themes that came up during phase one? Jumping off the discussion of themes in phase two, compile a list of “core values” for your organization as a group. What common themes are most important to the group as a whole (education, fun, inclusion, service, stewardship, etc)? Pare this list down to the most basic, all-encompassing values. Pose the question: what will you, as a leader, do to uphold these values? Have leaders discuss or write down their responses. This activity is a great jumping-off point for the pledge activity (above). This activity will help leaders understand their own personal leadership styles. Understanding one’s own leadership style is useful when it comes to working with a co-leader and recognizing strengths and weaknesses. Have leaders place themselves along continua based on statements about their personalities (see here for a full outline of the activity courtesy of Harvard’s First-Year Outdoor Program). As a result of the activity, leaders will be “categorized” in one of four leadership styles. Facilitate a discussion of what it means to exhibit a certain style of leadership, and the benefits of being a flexible leader who can inhabit multiple styles depending on the situation. Zoe Gates has served as President and Vice President of Brown Outing Club, redrafting a constitution, aiding in a club structure overhaul, renting out gear and leading trips. As an intern at College Outside, she’s discussed the nitty-gritty of running an outdoors club with hundreds of student leaders and advisors from across the country. Got advice to share with other student leaders? Email zoe.gates@collegeoutside.com or post on our Collegiate Outdoor Leadership Forum Facebook page!